A beautiful spring day did not persuade people to pass up on the opportunity to learn more about ‘The Business Case for True Pricing’. 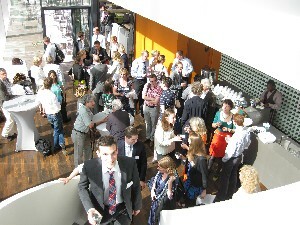 Over one hundred interested professionals attended the seminar. “Bringing together interesting people to talk about interesting topics” is what ultimately led to the Green Deal according to speaker Martin Lok (Program Manager, Ministry of Economic Affairs). This is similar to what True Price intends to do, in order to gather as much valuable input for the Business Case Report as possible. The seminar worked as a perfect platform to discuss ideas and concerns concerning measuring and monetizing social and environmental externalities. Keynote speaker Willem Lageweg (Director CSR Netherlands/MVO Nederland) referred to monetization as the bridge between the sustainability community and other actors in society, creating a common language. The panel of partners agreed that to not just be a drop in the ocean, it is important to cooperate and partner with other organisations in the sector nationally as well as internationally (Simon Braaksma, Philips). Monetization helps determine what is making a contribution and what is not in the jungle of ‘sustainability’ interventions (Arjen Boekhold, Chain Director, Tony’s Chocolonely), to express the value of products in the spirit of innovation (William van Niekerk, Director CSR, Royal BAM Group) and to find a common language for the financial and sustainability institutions in society (Koen de Snoo, Director of the Sustainability Directorate, Ministry of Infrastructure and Environment). Even though value is a subjective concept, monetization forces people to make those value judgements explicit. During the seminar a lot of interest was expressed in the method, the integration of positive externalities, the cases True Price has worked on so far, and the dilemmas faced during analysis. Even though negative externalities are more easily measured, True Price is in the process of making the method suitable to integrate positive impact as well. In the end, the goal is to mitigate the negatives and enhance the positives based on robust analysis. The free seminar ‘The Business Case for True Pricing’ will focus on exploring the opportunities of monetization of social and environmental impacts for your business. The seminar will be based on the trailblazing report that we wrote in collaboration with PwC, EY and Deloitte, within the True Price Platform. 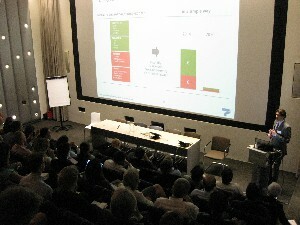 The seminar is a Plenary Session of the Green Deal ‘Transparency of Natural and Social Capital’ initiated by True Price, together with MVO Nederland, IUCN, the Dutch Ministry of Economic Affairs and Ministry of Infrastructure and Environment, and signed by more than twenty Dutch organizations, amongst whom leading businesses, financial institutions and NGO’s. The seminar will be in English. Herman Mulder, former Chairman GRI / Chairman True Price. Willem Lageweg, Director MVO Nederland. Martin Lok, program manager Green Growth Dutch Ministry of Economic Affairs. In case you are interested in attending the event, we kindly ask you to leave your contact details on this page. As part of the Green Deal on Transparency of Natural and Social Capital True Price organises the first open working group on Monetization. This will be an interactive session in which we will discuss the opportunities and risks of monetization for several Flagship projects, similar to the project of BAM. It will take place on the same date and location, from 16.00 to 17.00. In case you are interested in participating in the working group or would like to know more, feel free to get in touch with Michel Scholte via michel@trueprice.org. Earlier this year, Michel Scholte spoke on behalf of True Price at a conference organized by Global Nature Fund and titled “How Business Values Nature”. The event, held in Bonn in January, centered around ecosystems valuation and natural capital accounting. Specifically, participants went into the business case for ecosystems valuation and the progress made in the field so far. The conference proceedings and presentations – also by other speakers from Puma, UNEP, TEEB, and more relevant organizations – have now been made public and can be downloaded here. On December 6th 2013, the Sustainable Food Trust convened an international conference on the theme of ‘True Cost Accounting in Food and Farming‘. Bringing together world-leaders from across food, farming, conservation, research, finance and government policy, the conference aimed at investigating why our current economic system makes it more profitable to produce food in ways that damage the environment and human health, instead of rewarding methods of production that deliver benefits. Our Executive Director Adrian de Groot Ruiz presented a case study on the True Price of Coffee at the Sustainable Food Trust’s Conference. Michel Scholte’s talk at TEDxLeiden is now online, explaining the basics of True Pricing. The central theme of TEDxLeiden is the transition towards 21st century societies. Are we lacking perspectives to see other realities with great opportunity? What if we would for instance include hidden harms into the price of our products? Find out in the video above.